Thanks to the long list of nominees for my fifth anniversary giveaway theme, Almost, But Not Quite. They covered the gamut from famous to personal, beginning with one of my favorite games, being a big fan of LA's two World Series wins in the 1980s. For his nomination, reader Stealing Home relived the heroics of Kirk Gibson, who set the World Series tempo by overcoming McGwire's game 1 grand slam and nigh-unhittable Oakland closer Dennis Eckersley for a 5-4 Dodgers win and eventual 5-game title win. 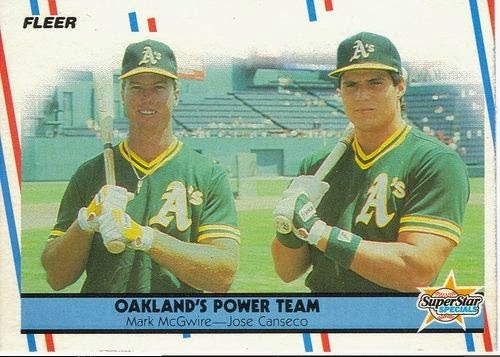 The Bash Brothers didn't have to wait long for a title, overcoming San Francisco just one year later, but 1988 wasn't quite it. Richard Nebe grabbed this sharp play by Phillie catcher Jose Quintero. Michael Jordan said great players motivate themselves by using every failing, criticism, or perceived slight to push their performance forward. If this 2010 lapse made Jayson Werth what he is today, it was worth it. Because otherwise...ouch, man, ouch. Dave Henderson's homer is the flip side of Mookie Wilson's World Series grounder through Bill Buckner's legs, as this two-strike, two-out blast sent Angels pennant dreams into extra innings and on to eventual defeat. Jeff also made this nomination for its image of 40 year-old Reggie Jackson standing on the dugout steps, Mr. October poised for one more World Series, only to be denied at the last. GCRL echoed Reggie's dugout step frustration as an indelible image, but kept his nomination close to home with LA's parade of mid-80s AAA "almosts." 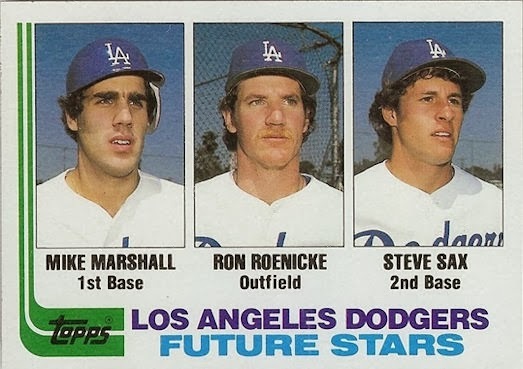 The Dodgers farm system seemed unstoppable in the early 1980s, as Steve Howe (1980), Fernando Valenzuela (1981) and Steve Sax (1982) all took home Rookie of the Year trophies and a 1981 World Series win helped shift the New York power balance away from the Bronx (and towards Shea Stadium) for several years. What LA's 1988 team won with smoke and mirrors, 1981's squad helped take with promising young stars. Next up, Mike Marshall! Candy Maldonado! Greg Brock! Except...not really. The hyped superstar promise never materialized as superstar performance, leaving fans with that empty feeling you get when "dessert" turns out to be a tray of burned cookies. 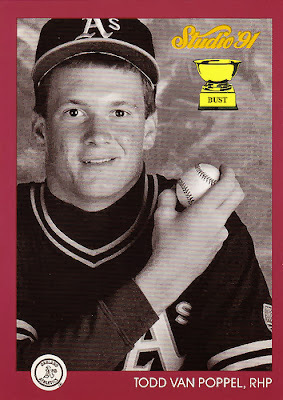 The younger version of blog reader Fuji invested in TvP cards, a mid-90s prospect who did his best work a half-dozen years later as middle reliever for the Cubs. If your career high point is middle relief in a city far removed from your "future Nolan Ryan" expectations, you too might inspire a page like The Curse Of Todd Van Poppel. Night Owl returned to purchasing cards in 2006 and cascaded dollars and enthusiasm upon pack after pack until all checklists were checked...save one. 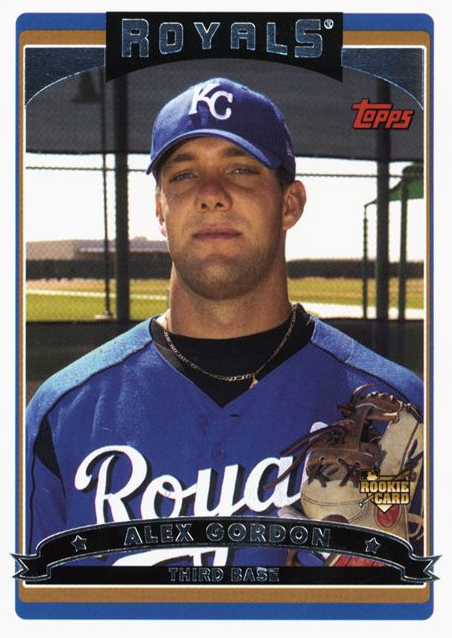 Still missing from his collection is #297, this Alex Gordon RC now valued in the four figures thanks to Topps' last-gasp decision to pull a player with no MLB experience, which should've precluded his appearance in non-minor league sets. Did Topps make a mistake or calculated gamble that a "pulled" Gordon would generate disproportionate collector interest? 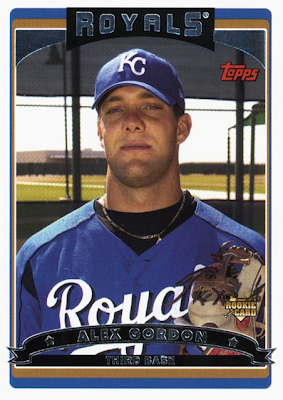 Keith Olbermann added his own context (and a rare proof scan) in The Heritage of Alex Gordon, which explains without making people like Night Owl feel any better about the situation. Given its AAA level, winning the 1994 Pacific Coast League MVP award should mean big league stardom lies ahead, not that fans and front office executives now have a measuring stick for future frustrations. "Guess I won't be needing this..."
Greg Zakwin nominated this "sure-thing" Dodger superstar for finishing with below-average fielding (-1.5 career fWAR), slugging (91 OPS+), and on-base percentage (.302) in parts of 7 MLB seasons. Even his Baseball-Reference page sponsor laments that Billy's prodigious minor league power never clicked anywhere else. Then as now, buuuuuuummer. Speaking of things from 1994, check out the solid, young lineup fielded by Montreal's Expos, where Pedro Martinez was just 2nd or 3rd-best on his team's pitching staff. Mark Aubrey notes how far ahead of MLB competition Montreal stood at 74-40 (a full 3.5 games better than AL-best New York), only to be derailed without a post-season by the MLBPA strike. They'd never finish first again. 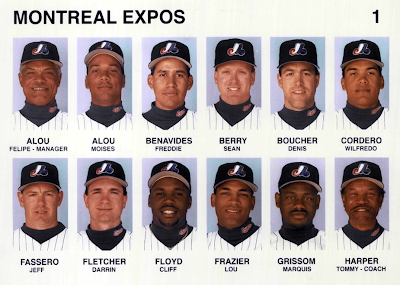 I felt bad for them then and doubly regret it now that Les Expos have gone the way of the Seattle Pilots and St. Louis Browns. Thanks to a friend with tickets in Detroit, Potch could've attended this Tigers game, one of the last Roger Clemens would pitch in Boston red-and-grey. If he'd made it, all would've enjoyed the Rocket's second 20-strikeout performance, a taste of history and achievement that made me feel slightly better about his 20 punch-outs against my Seattle Mariners ten years earlier. With so many good choices, I had to randomize the winner or risk getting sentimental and declaring all 9 nominations a winner. Thanks to Random.org, here's who doesn't have to wonder what could've been! Our number generator selected #4 (retired for Duke Snider), so that means Dodgers fan GCRL wins the selection of vintage cards from his favorite team. I'll go out on a limb and assume that team is the Dodgers. Congrats to him and thanks to everyone for sharing and following along these last five years! sweet! 4a players finally amount to something - vintage for me! Congrats GCRL. And thanks, Spike, for a good contest. May you have many, many more years of blogging before you.